C-PENT Eye Drops is a potent para-sympatholytic drug of great value in including cycloplegia and wide mydriasis having rapid onset, shorter duration and greater intensity. This anticholinergic preparation blocks the responses of the sphincter muscle of the iris and the accommodative muscle of the ciliary body to cholinergic stimulation, producing pupillary dilation (mydriasis) and paralysis of accommodation (cycloplegia). It acts rapidly, but has a shorter duration than atropine. 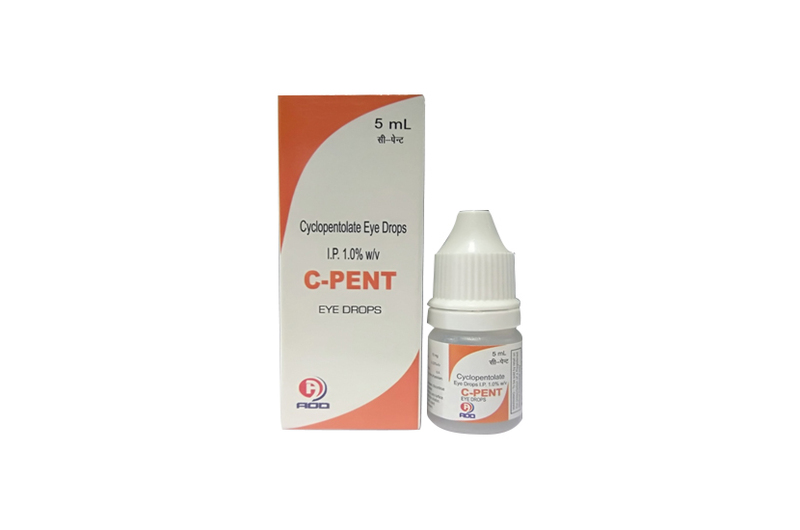 C-PENT Eye Drops is used to produce mydrisis and cycloplegia. It may be used in the treatment of ititis. iridocycloclitis to prevent the formation of posterior synechiae and rest the painful cilliary and sphincter papillae muscles. It is also useful for refraction studies in children. C-PENT Eye Drops is used before eye examinations (e.g., refraction exams). It belongs to a class of drugs known as anticholinergics. Cyclopentolate works by temporarily widening (dilating) the pupil of the eye and relaxing the muscles of the eye. C-ART -Eye Drops (Sodium Carboxy Methyl Cellulose & Glycerin Sterile Ophthalmic Solution), for temporary relief from burning irritation and discomfort due to dryness of the eye or due to exposure to wind or sun. May also be used as a protectant against further irritation. It should not be used when marrow angle glaucoma or anatomical narrow angles are present or where there is hypersensitivity to any component of this preparation. To avoid contamination do not touch tip of container to any surface. Replace cap after using. If you experience eyes pain, changes in vision, continue redness or irritation of the eye, or if the conditions worsens or persists for more than 72 hours, discontinue use and consult your doctor. There are no adequate and well-controlled studies in pregnant women. C-PENT Eye Drops should be used in pregnant women only if the potential benefit to the mother justifies the potential risk to the embryo or fetus. One drop, followed by a second drop in 5 minutes. Complete recovery usually occurs in 24 hours. One drop is instilled in each eye, followed 5 minutes later by a second application if necessary. Pretreatment with C-PENT Eye Drops on the day prior to examination usually is not necessary. In order to minimize systemic absorption, apply pressure to the tear duct for two minutes immediately after administration. C-PENT Eye Drops is supplied in 10ml clear poly bottles packed with printed labeled in a unit carton and, Such 25 Carton packed in a shrink sleeves.such,12 shrinks packed in a shipper.